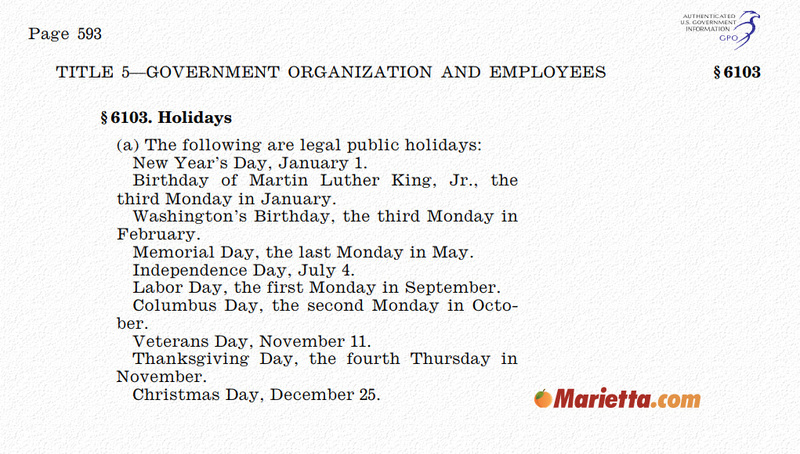 Ten federal holidays are established in Title 5 U.S. Code § 6103. New Year’s Day takes place on January 1 each year. The birth of Martin Luther King, Jr. is celebrated on the third Monday in January. His actual birthday was on January 15, 1929. Washington’s Birthday, commonly referred to as Presidents Day, takes place on the third Monday in February. George Washington’s birthday was February 22, 1732. Memorial Day is celebrated on the last Monday in May. The holiday, also known as Decoration Day, is a holiday for remembering the people who died while serving in the U.S. armed forces. Independence Day takes place on July 4 of each year. Also known as the Fourth of July, the holiday commemorates the adoption of the Declaration of Independence on July 4, 1776. The Declaration of Independence declared that the thirteen original colonies were free and independent states no longer connected to the British Crown. Labor Day takes place on the first Monday in September. The holiday celebrates the American labor movement and workers contributions to the U.S.
Columbus Day takes place on the second Monday in October. The day celebrates Christopher Columbus’s arrival in the Americas and became a federal holiday in April 1934. The actual date of his arrival at an island in the Bahamas was on October 12, 1492. Veterans Day is observed on November 11 each year. The day honors military veterans of the U.S. Armed Forces. The day was formerly known as Armistice Day and marked the end of World War I at the 11th hour of the 11th day of the 11th month of 1918. Armistice Day was renamed Veterans Day in 1954. Thanksgiving Day takes place on the fourth Thursday in November.It is sometimes referred to as “First Thanksgiving” in recognition of the celebration and feast by the Pilgrims (and attended by Native Americans) after their first harvest in the New World in October 1621. Thanksgiving became a federal holiday in 1863, during the American Civil War, as a time to give thanks and celebrate with a feast. Christmas Day takes place on December 25 each year.